Ed Lotkowski outside his home in West Chester on Tuesday, Jan. 16, 2018. Lotkowski is outraged that the borough immediately initiates criminal court proceedings if someone is cited for not adequately shoveling their sidewalk. The pharmacist got a summons a few weeks ago. Ed Lotkowski knows snow. He grew up in Manayunk, and anyone who's spent any time in that craggy mountain of a Philly neighborhood knows that Yunkers aren't special snowflakes when it comes to winter messes. You shovel — or you never leave the 'hood. So imagine this. It's not until a few weeks ago — and all the way out in West Chester, a flat little borough whose snowy, historic streets made it into the movie Marley & Me — that Lotkowski got his first real winter wallop. A court summons made it to Ed's doorstep late last month. 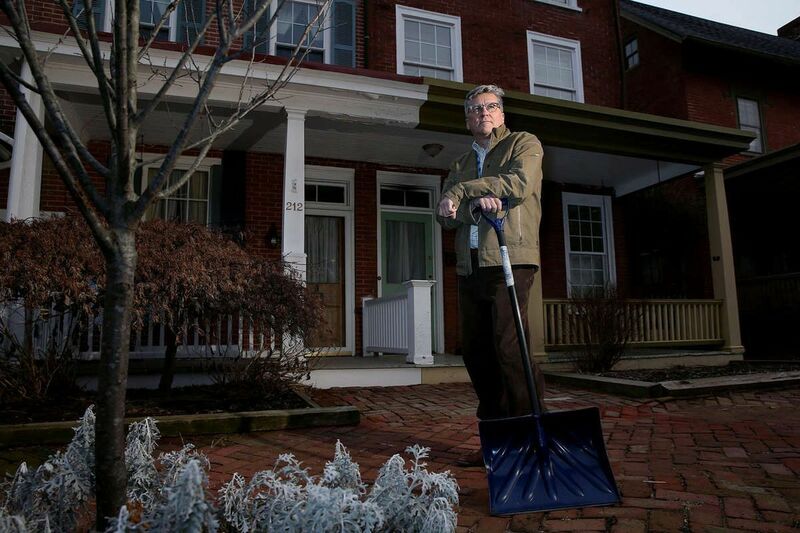 It said Ed had violated the borough's snow-shoveling ordinance a few weeks before Christmas. He had to pay $114.71 to clear his name. He'd potentially be arrested if he failed to pay up or show up in court in February. Commonwealth of Pennsylvania v. Edward Lotkowski. That was the greeting at the top of the paper. Yes, Ed could end up in handcuffs. What did he allegedly do wrong? There was snow on the brick sidewalk in front of his rowhouse more than 24 hours after a Dec. 10 storm. Never mind that Ed said he'd shoveled and done his best, but the wind must have blown a bunch back onto the bricks. He'd gotten no initial citation and no warning of any kind before a code inspector threw the book at him. The paperwork went straight to the county courthouse, a few blocks from Ed's house. "It's like I'm in Bizarro World," Ed says. "Did you ever read Bizarro World, the comics, where everything is backwards?" Before we examine right v. wrong in Commonwealth v. Lotkowski, let's pause for a moment to consider Ed. Ed doesn't come across as a flamethrower sort of guy. He's a big Eagles fan who won't tell you that they'll win the Super Bowl. He just can't imagine them actually winning, because the 62-year-old has simply never seen it happen. As much as he loves the sport, he also thinks the NFL is shamelessly profiting off the broken bodies and skulls of its soldiers on the field. He's a hospital pharmacist with three grown daughters. Divorced. Moved to the burbs years ago to raise a family. Likes that West Chester is a nice place to call home. "I'm not a gadfly," he says. Yet he showers me with detailed emails and court documents about the Shoveling Scandal, which now requires his appearance before a judge next month. He's also got, bless him, some sweet Philly edge. "After Feb. 13," he insists, "I will return to my empty life." What Ed is not, in this instance at least, is a rabble-rouser without a cause. What went down in picturesque West Chester represents what so many of us find ourselves on the receiving end of more than once in our lives as mere citizens in a bureaucratic machine: policy-making not at its best. The law says he owes a $25 borough fine. But he never got to pay just that — the infraction gets processed by the Chester County Court, which gets to heap its own fees onto the bill, too. "They didn't give me the opportunity to just pay the $25," Ed told me. "The fact that they added [about] $100 to me is outrageous." West Chester, a 1.8-square-mile town of 20,000 residents, is in the richest county in Pennsylvania. Yet its leaders decided years ago not to issue warnings to snow scofflaws. Borough Manager Mike Perrone said that's because landlords near West Chester University had become unrepentant scofflaws. Court action, he says, has gotten their attention through the years and helped ease the problem. State law requires that citations get processed through the court, Perrone said. This has come, however, at the expense of ordinary homeowners. They don't, as a matter of policy, get so much as a door knock from code enforcement before being sent down the river. The new mayor, Dianne Herrin, doesn't buy that a well-meaning law should fast-track ordinary residents onto a criminal court docket. She told me she plans to address it in the next few weeks. "The process needs to be reevaluated," Herrin told me, "and we should figure out what our other options are." The borough manager estimated that about 50 citations were issued alongside Lotkowski's for the Dec. 10 storm. Big Bad Philly, whose state-overseen Parking Authority is where citizens' souls go to die, has a kinder, gentler snow-shoveling process than quaint West Chester. Violations in the city go to a noncriminal administrative entity for appeal. No criminal court date for you, sonny. Ed says he'll roll with the punches next month. If he loses, he'll pay. "I'm not a big shot, right? I'm one of eight children, I grew up in a three-story row home, one bath. There's no animosity in my body about getting a ticket for another $100. It's just that it's so unjust."